The United States has (for the most part) been on the right side of history during the Arab Spring. It didn’t take long for the U.S. to condemn and push for the ouster of Hosni Mubarak of Egypt, Muammar Qaddafi of Libya, and more recently Bashar al-Assad of Syria. America advocated for democracy in the Middle East, supporting the protesters’ calls for free elections, an end to corruption and for equal rights. However it’s nothing new that the US has engaged in double standards. While it has been a vocal voice in democracy in the Middle East, it doesn’t apply to Saudi-proxy GCC member, Sunni Caliphate governed Shia majority Bahrain. Bahrain is located next to Saudi Arabia in the Persian Gulf, governed by a Constitutional Monarchy compete with King Hamad bin Isa Al Khalifa, Prince Salman bin Hamad bin Isa Al Khalifa, and Prime Minister Khalifa bin Salman Al Khalifa. It gained its independence from Persia in 1783, and has a population of only a little over a million. 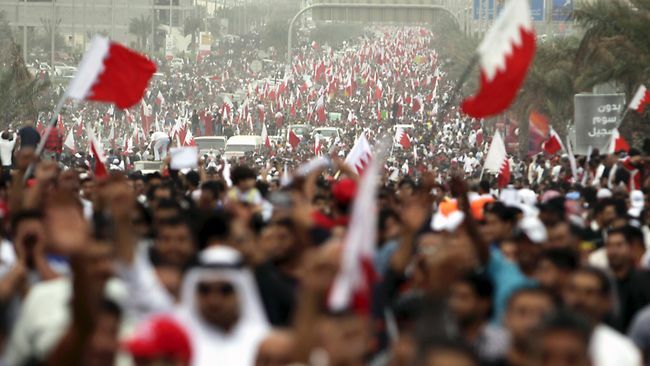 Bahrain’s small size is no excuse to the virtual zero attention its revolution has received from the media. The monarchy has allowed no foreign journalists inside the country, shutdown social media and even cellphone reception at times to prohibit protesters from sharing what was going on to the rest of the world. Posted at the end of the post is a list of places you can find information, often updated daily, about the Bahrain revolution. However through documentaries like Shouting in the Dark and bloggers and tweeters that have been able to defy the crackdown and social media blockage, the atrocities in Bahrain toward the peaceful protesters are becoming increasingly clearer. 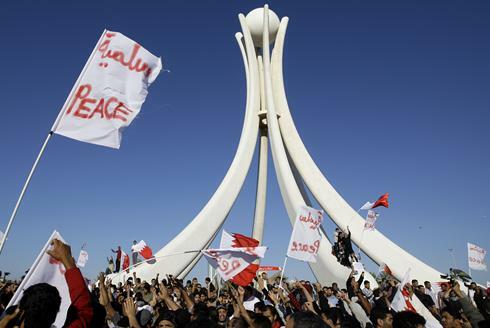 In February 2011, only a few months after the Tunisian uprising, Bahrainis held their first major rally at the Pearl Roundabout . Among the chants, “Sunnis and Shi’ites are brothers” can be heard as well as signs protesters carried stating “Peace” to establish that a peaceful rally was taking place, not one inciting sectarian divide. The protesters demanded for a new constitution and elections for the entire parliament, considering that many of its members were appointed by the King, and an end to corruption. Initially the Monarchy responded by holding a “dialogue” with members of the Bahrain Revolution, like Parliamentary Member and revolution advocate Matar Matar. However the crowned Prince became stuck between government hard-liners and protesters demands, and in the end did little to bring change to the government. Thus, the protests continued, many called the dialogue failed talks and refused to engage in anymore fruitless talks with the government. They did not want to negotiate the rights they believed were rightfully theirs. The reaction of the Bahraini government isn’t that different than Qaddafi and Assad’s–immediate crackdown, with the help of their GCC partners. Saudi Arabia sent “the Shield Force”, which is an army of soldiers from all the GCC countries to secure Bahrain’s “national security” from the protesters, or as they deemed, “traitors” and “Iranian stooges”. It came at no surprise to the protesters considering that already the police force and Bahraini army are composed of Sunni Syrians and Saudis meant to control the Shia majority. Some of the people detained and sentenced for being traitors are not even protesters themselves (although most are opponents of the government, as increasingly most Bahrainis are becoming) the nurses and doctors mending wounded victims of the harsh crackdown. The government has called hospitals like the Salmaniyya Hospital “terrorist camps” and have accused them of holding Sunni patients as hostages. Of course, none of these allegations are true. Salmaniyya Hospital is made up of both Sunni and Shia nurses and doctors, and have kept to their mission statement of treating anyone who comes through their doors. In the beginning of the crackdown, it was the western-educated doctors with their worldly connections that raised awareness of the carnage. 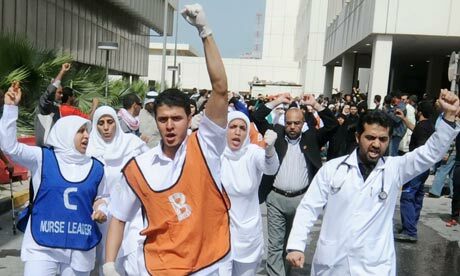 Indeed, around 10% of people connected to the Bahrain revolution that the government has detained are medical staff. The Bahraini monarchy has entertained the idea of consolidating Bahrain with Saudi Arabia, a blatantly powerful country that is Sunni-majority that would relinquish power from the Shia majority in Bahrain [and expand Saudi’s influence over the Middle East]. In the meantime however, Bahrain has recently been given weapons by the United States government despite the human rights violations. My Oregon Senator Ron Wyden has been leading the effort to stop the arms trade with Bahrain and push the government to use its influence over the region to stop the bloody crackdown on protesters. There’s hope. Unlike the Algerian revolution “that never was” or the failed Green Movement in Iran, the Bahraini Revolution is (in my opinion) at its climax because the world has finally turned its head toward the Bahraini people. Beginning with the mass imprisonment of medics and harsh sentences, then leading to the hunger strikes of detained opposition leaders and protesters, and to the protests and boycott of the F1 Grand Prix Car race, people around the world are beginning to become aware of the injustices. The protesters are demanding for elections of all Parliamentary members, an end to corruption and a new Constitution. The government has plenty to be afraid of if they decide to meet the protesters’ demand, but that’s what happens when the majority of the country oppose your rule. Bahrain isn’t Syria. The protesters are Sunni and Shi’ites alike, reminding the world that they are brothers and merely want what the other Arab revolutions got. This isn’t a country divided by sectarian tensions, but instead a country divided by the government and its people. This form of governance, and seen through the Arab Spring is a tirying one that needs to end. While the Bahraini King believes that “he who is not with the regime is against it”, people of the revolution believe that those who do not support the revolution must be against freedom. The United States, a self-declared model for freedom and liberty, must decide which side they lie on. ← Where’s the fight to protect our Due Process?